I'm so sad. 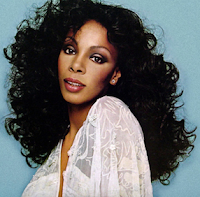 One of my favourite singers, the fantastic disco diva Donna Summer, has passed away. She had been battling Cancer for a while and sadly lost the fight. She was sixty-three years old. This is such sad news. I've been a huge fan of hers for ages and I can't believe she's really gone. But Donna's amazing voice will live forever, that's for sure. Rest in peace, angel. We miss you already. I don't understand people who never ask how others are and who only talk about themselves. Sure, when you feel bad it can sometimes be difficult to think of others, but when it happens over and over again, it's a problem. All relationships are about giving and taking. "How are you?" is a very simple question to ask but it means so much. The world would be a much better place to live in if people stopped to think of others every now and then. A friend sent me this video, taken from a gay party in Italy where they are partying to my single "Drama Queen". I hear they are planning to use it as a theme song for their summer parties. Great news! Italians do it better!